A year ago today, harvest was nearly finished. It was the tenth of October that we completed our final field, which happened to be a very late crop of durum. While the harvest of 2013 had its challenges, including some rain delays and a couple frustrating breakdowns, it was completed at a time we could be happy with- and it was a monster of a crop. This year has been very different. Rains kept us out of the field for much of late August and early September. While we were able to get a fair amount done during that time, including our winter wheat and green peas, our poor durum sat out in the field through it all. 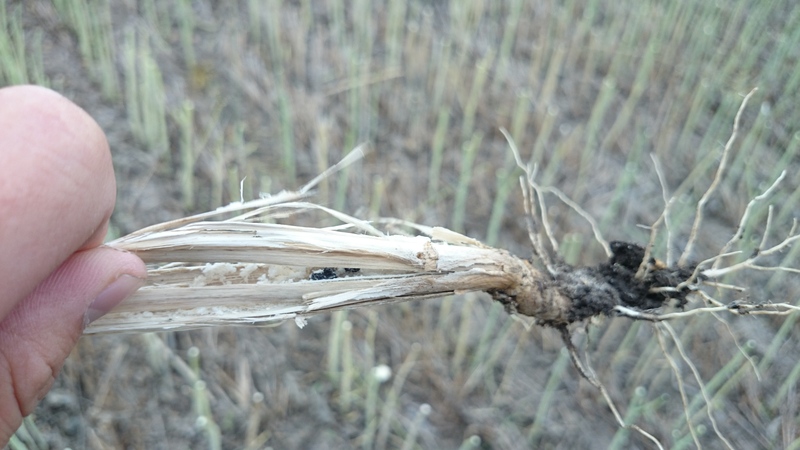 Durum is very susceptible to grading losses in such conditions, and ours was no exception. Traditionally, durum has been one of the best paying crops in our area. It almost always out-yields its cousin, spring wheat, and usually pays better, too. It is used for pastas, primarily. Next time you make spaghetti, check the ingredients; you will see that durum is its base origin. For reasons that I have yet to understand (despite a fair amount of research), durum simply grows well in this area. Go a few miles east or north, few farmers grow it. From our home and west, however, the landscape brims with field after field of durum. 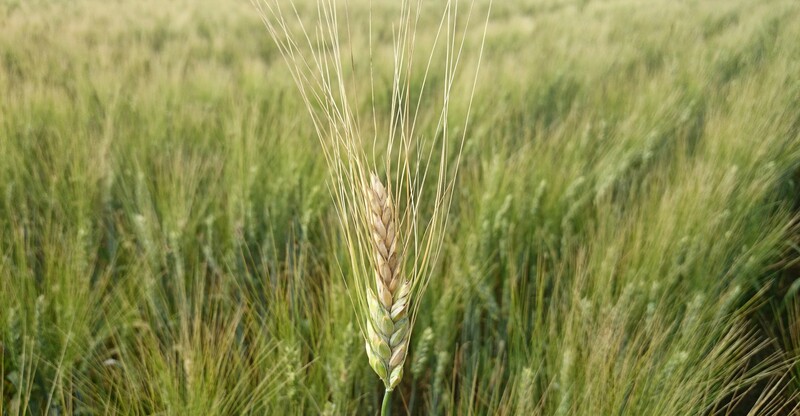 Unfortunately, in the last few years, our durum production has been threatened, with late springs and disease taking their toll. One disease in particular has reared its ugly head in a big way this year: Fusarium Head Blight (FHB for short). This disease is particularly fond of durum. Basically, this fungus enters the head as it undergoes its flowering stage, typically in late July. Its symptoms are not visible until late in the season, when it is far too late to do anything about it. Preventative fungicide sprays do work, but they have limited effectiveness on the disease in years where the humidity is very high for a prolonged period in the summer. Warm, damp conditions can cause severe proliferation of the disease. Essentially, the seeds produced by the plant are damaged by the fungus, and sometimes seed production may even be diminished. This is an infected head near maturity. Notice the top of the head- not many seeds in there. This year has the worst infection levels I have ever seen. We are seeing substantial downgrading from our buyers. This crop is graded on a basic numbering system: it starts as a #1 CWAD (Canadian Western Amber Durum) and works its way down to a #5 CWAD (if it’s really poor, it goes even lower than that- sample is below #5. We have that grade this year, too). The difference in price between these varies from year to year, but this year the difference is over $4 per bushel, depending on the buyer. So, take your average durum yield, say 50 bushels per acre, and calculate what your losses are on 2,000 acres. That is the number many durum producers are looking at this year (give or take some acres and yield). Fortunately, yields are pretty strong, so that kind of makes up for the poor quality. But, some durum is so bad this year that some producers cannot even sell it. You see, Fusarium produces “vomitoxins” that are difficult for animals (yes, that includes people) to digest. Think “toxin” and “vomit” and you get the idea. If people can’t eat it, and livestock can’t eat it, what do you do with it? Simple- it’s garbage. Burn it, bury it, whatever. But it’s total trash. No, we don’t have any durum that bad. But some of ours is awfully close. Even spring wheat has been heavily affected this year, which is quite rare. In a year as wet as this one has been, disease is a serious issue- in all crops. Notice the shredded stem with the black spots inside? That’s Sclerotinia Stem Rot. It definitely compromised the yield of this canola plant. Even stripping out the disease portion, all the rains have severely compromised the quality of all types of wheat, as well as lentils, barley, and a variety of other crops. 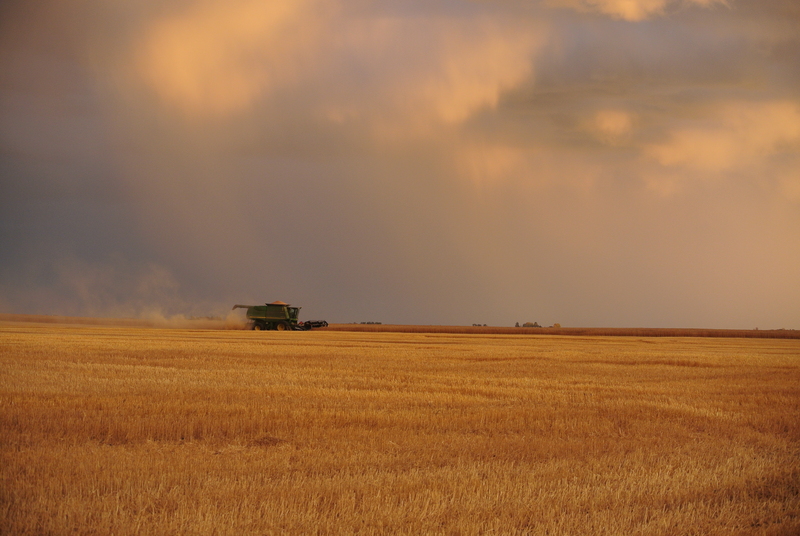 The rains simply came at the wrong time this fall- right at the beginning of harvest. And now, we sit again, with nothing moving for the past week. We still have a ways to go to finish harvest, and many of our neighbors, especially to the east of us, have even further to go. Is this a disaster scenario? No. At least, not for us. Our durum yielded well enough, and our costs are low enough, that we can actually break even on #5 durum this year. One advantage of growing a variety of crops is that some are pretty resilient to ugly harvest weather. For example, flax, soybeans and canola are pretty tolerant to harvest rains and really haven’t seen a reduction in yield from this weather. Frost beat up the flax and soybeans a bit, but it may not have done as much damage as we feared. It did get awfully windy one day, which can be very damaging to ripe, swathed canola, but it didn’t get us on too many of our acres. 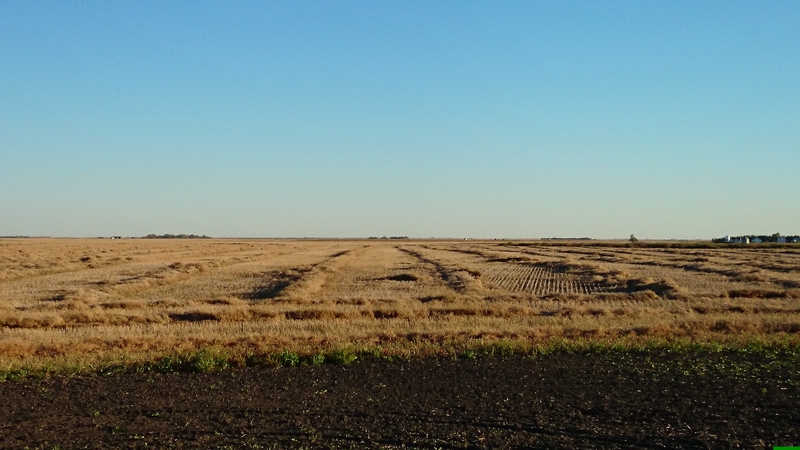 Take a close look at these swaths. The wind moved them around pretty badly. That costs a lot of canola. I guess when you look at harvest 2014 on the whole, it really has been a harvest fraught with every kind of yield reducing factor you can imagine. Rain, frost, wind and disease all took their toll this year, with no crop escaping from them all. Only our winter wheat got through relatively unscathed, due to its early harvesting date. I do want to make one thing clear: I consider us to be pretty lucky with what weather we have gotten. Obviously, it could have been a lot better. We could have gotten less rain, less wind, and warmer nights. But we could also have gotten snow (southern Alberta did), we could have had that windy day earlier, when more canola was unharvested, or we could be getting stuck in our fields every day, like some of my friends have been. The thing is, no matter how bad the weather may be, somebody is always getting it worse somewhere else. No matter how bad your year, or your month, or your day has been, it could always be worse. The fact is that 73% of our harvest is completed, when it could be 50%, or 30%. Sometimes, when things look really bad, you just need to sit back and think about how good some things are (although, if it snows next week, you may see my mood shift a little darker). Hopefully we can resume harvest tomorrow. We still have many other jobs to do as well, like spraying, tilling, and grain hauling, so we need a good stretch of nice weather to get through it all. But it will come. It always has.